Tommy Brown cut his teeth on classic, traditional bluegrass. A third generation musician, Tommy began pickin' the five-string banjo at the age of six. His powerful banjo style garnered him both the Kentucky State and Tennessee State Banjo Championships. His impressive pickin' style and soulful vocals embrace his passion for the mountain-style music he performs today. The County Line Grass was formed in 1991 with a group of friends who just happened to live across the county line, thus the name, Tommy Brown & the County Line Grass. These days the band is more of a family affair with Tommy's children and close friends joining him. Son Jereme plays lead guitar and lends his poignant lead, tenor and baritone vocals to the group. Daughter Rachel with an instrument twice her size, skillfully provides a solid, yet spirited rhythm on acoustic bass. Providing steady rhythm and lead and baritone vocals is close family friend, Josh "Jug" Rinkel. Josh being a talented songwriter as well, has also penned most of the group's original material. Rounding out the band, Wayne Fyffe’s energetic fiddle will make you get up and dance, while his emotional back-up work provides the perfect complement to the groups moving ballads. 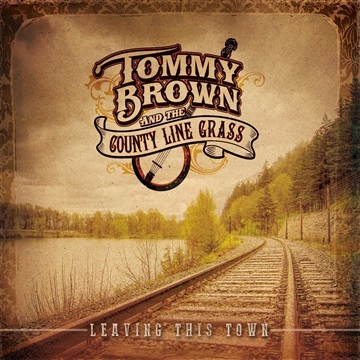 Tommy Brown and the County Line Grass have released nine outstanding albums: Road Signs and White Lines, Reminiscing, Mountain Bluegrass, Hard Drivin’, Fallen Leaves, I Wanna Go Back, Heartbreak Road, Way Back When. Their latest, Leaving This Town, is out now on Randm Records. Pleasing audiences around the nation while still holding true to their beloved traditional, mountain-style bluegrass, you don't want to miss this entertaining group!